The history of Solar dos Ventos has started back in 1989, when the owner and his wife informally began to host visitors in a spare room of their house. They gradually began the construction of bungalows separated from the main house to add comfort and privacy to their guests. Today Solar dos Ventos is considered to be one of the best home-inn of Fernando de Noronha and has been the only one to be classified as a three-dolphin home-inn by the Administration of the island. The pousada is located on the southern end of the island. Only 300 meters away from “Baía do Sueste” or Southeast Bay, which serves as the main feeding and copulating point for fish, octopus, lobsters, rays and marine turtles in Noronha. 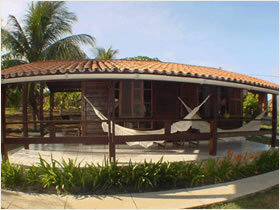 The bungalows are equipped with queen size beds and some even have two additional twin beds for families. In addition, they offer minibar, air conditioning, TV, hot-shower, telephone, private balconies with hammocks and turn-down service. The breakfast room also facing the ocean offers regional delicacies such as curau, tapioca and sliced fruits and fruit juices made with fruits that are grown in our home-inn such as pitanga, papaya and guava. For the foreign tourist they also offer warm items such as fried and scrambled eggs. The reception is prepared to offer any assistance the guest may need such as maps, weather forecast, Internet access, assistance for buggy rentals, sightseeing by boat, horseback rides, trekking trails, island tour, and scuba-diving. The guest can have a buggy waiting for him at our parking lot even before he lands in Noronha.